Palcohol is probably the biggest story in my 25 years of working with alcohol beverage law. As much or more media interest as compared to absinthe or Four Loko, or even direct shipping. 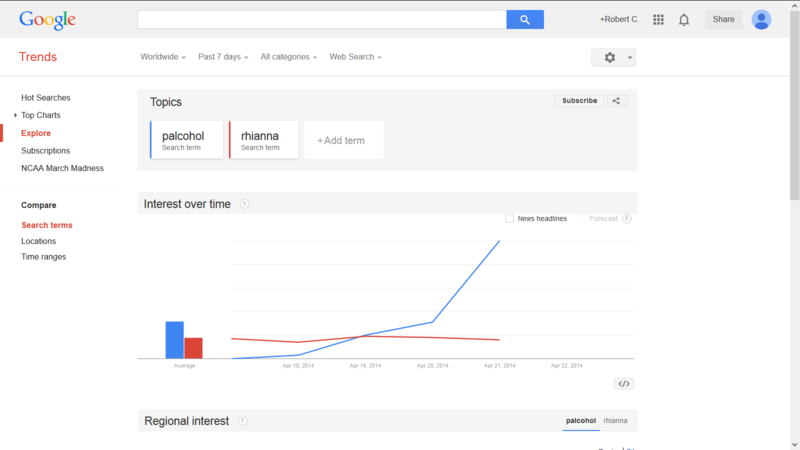 Palcohol went from zero results on Google as of April 18th to more than 2 million as of this writing (and 4 million as of May 2). By some measures it’s bigger than Rhianna. * So, what happened? This FAQ expands on and updates our original blog post first published on April 18. It is powderized alcohol. By the way, we don’t represent Palcohol or speak for them. The technology is explained here. It is much more portable as compared to heavy liquids. It is not clear that the US Government has ever approved a powdered alcohol in the past, even though the technology has been around since the 1970s. Is it approved or not? The Palcohol company has made a huge amount of progress toward bringing this to stores. They have about five formula approvals and a distilling permit. These are big projects and major accomplishments. Formula approval usually takes a couple of months and involves a thorough review of all ingredients and methods. The permit usually takes six months or more and involves background checks, plant diagrams, lists of equipment and a review of security measures. Beyond all this, the company secured label approval for about five powdered alcohol products on April 8. This is the last step in the federal system. For two weeks Lipsmark (the company) had all federal approvals necessary to make and sell the product. 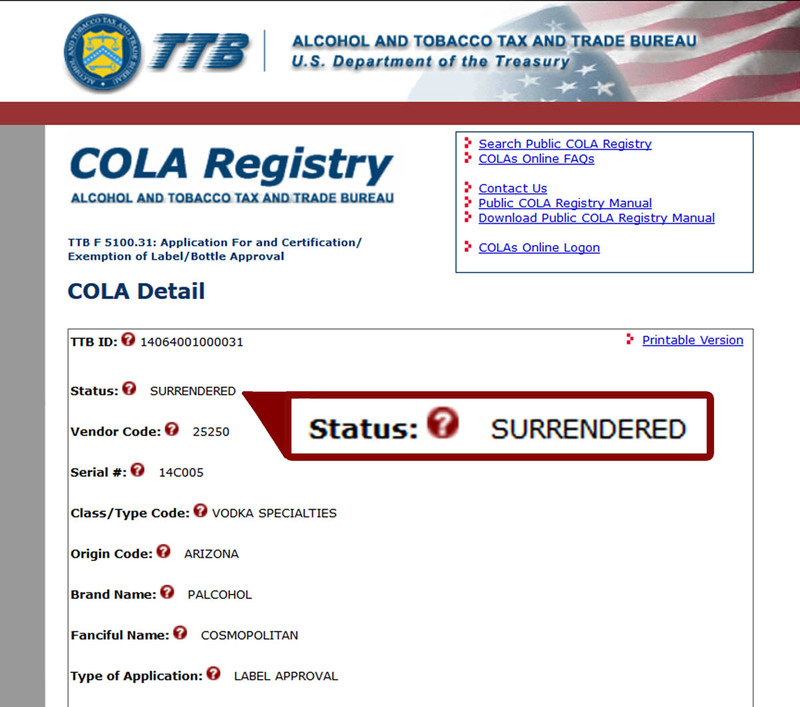 Then, on April 21, Lipsmark “voluntarily” “surrendered” those approvals. It is not yet clear why the Palcohol company would do this. It is not yet clear if or when the company will secure new and replacement approvals. The government has no authority to simply cancel the approvals, so that is not a plausible scenario. 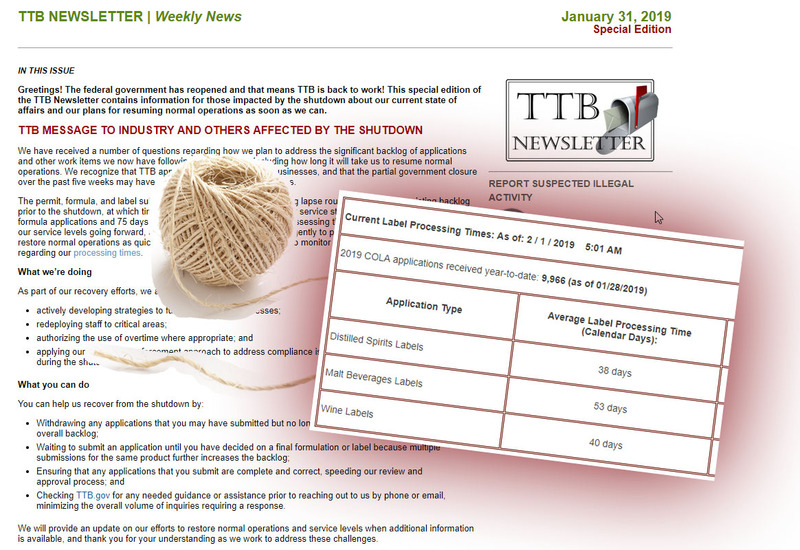 The government simply says the approvals were “issued in error.” The company has said it is a technical issue related to the labeling only, not the underlying concept, product or formulas, and they are working with TTB to remove this issue. It probably relates to making it clear how the taxable commodity (the quantity of alcohol) can and should be measured and disclosed on the labels. Because of all the bad and good at point 4 above. It will probably be several months, at least. Even if Lipsmark did not surrender the label approvals, they would still have lots of work to do before racking up some sales. They need to find and sell through wholesalers and get a bunch of agency approvals in every state they sell into. I talked to one New York expert, for example, and he tended to say New York would not go fast to allow this. Ironically, Lipsmark probably has all necessary US approvals by which to make this in Arizona and sell this in countries outside the US (or could easily get such approvals). The technology is not new. It has been around since the 1970s. 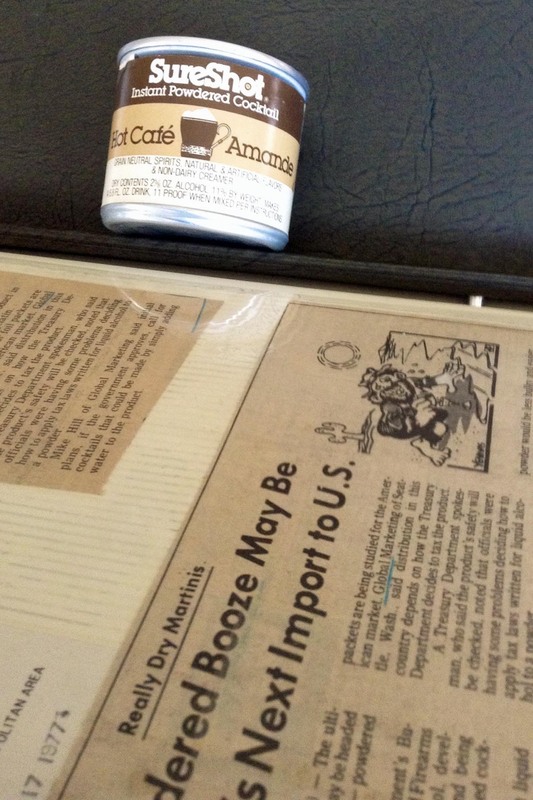 Here is a 1977 newspaper article and a 1978 article about another powderized alcohol product called SureShot. Mike Hill was the force behind SureShot according to the articles; he has recently explained by phone and email that he got past federal approval to test marketing and commercialization, but his company was never able to overcome various technical problems such as clumping, bulk, expense, and the need to use warm water to dissolve the beads. Our earlier post mentions the past patents on similar products. The new part is that, at least for the first time in 30 or more years, Palcohol actually got past federal formula and label approval, even if only temporarily. This is a big and important step and not to be minimized. TTB did most all the review and approval here. 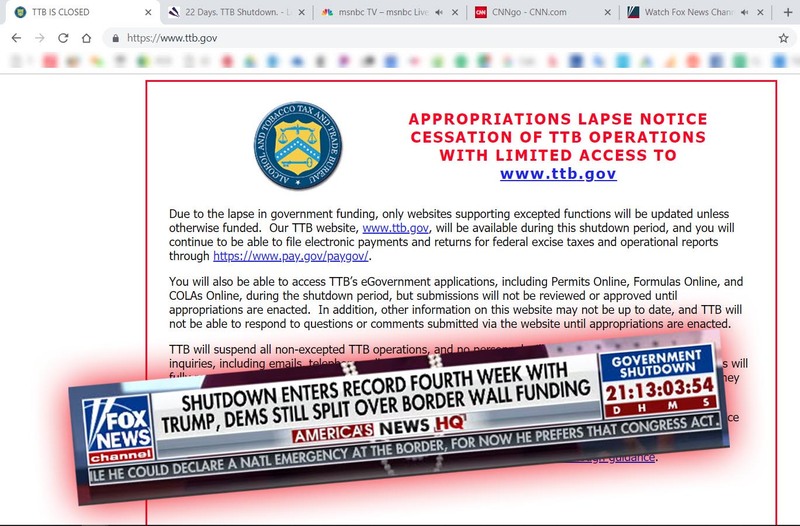 TTB is a sub-unit of the US Department of Treasury and this makes sense in that a huge aspect of alcohol beverage regulation is making sure the taxes get duly collected. Almost always through history, the tax has been based on the volume of alcohol; that’s tough to measure here. In the 1970s this agency was part of the IRS and in the 1980s it was known as ATF. FDA has not played a big role in the Palcohol matter to date, so far as we know. By contrast, in the matters of absinthe and Four Loko, both FDA and TTB played big roles. What brilliant lawyer persuaded TTB to allow this? So far as we can tell, Mark Phillips did this on his own, without help from any lawyers. This is an impressive accomplishment. Mark has said he worked with TTB on this for many years, patiently and cooperatively. Perhaps Mark had a bit of “beginner’s luck” on his side. On the other hand, the same absence of seasoned experts may have led to various stumbles like not realizing all label approvals are public, and that it’s not wise to make light of alcohol abuse, even on a draft web page. It is tough for TTB to withhold approval when the law provides no clear basis to do so. The law probably did not anticipate something new and different like this, just as the relevant rules, most of which were written many generations ago, have failed to anticipate and show the way on many other new things like caffeinated malt beverages, booze with vitamins, gluten-free beer, kombucha, even saké. What would you do if presented with this question? If you are feeling tough and would disallow it, under what rule? And if you can’t find such rule, what specific rule would you write? I think these are tough questions and I don’t think TTB has an easy job when it comes to things like this. Unlike other agencies, TTB is put in the unenviable position of giving a thumbs up or a thumbs down on every cockamamie marketing idea that comes down the pike. TTB does not have the luxury of saying “no action” like so many other agencies use to sidestep the trickiest issues. Why change course? It is possible or even likely that various states, other alcohol beverage companies, various interest groups, doctors, the media, legislators, and others across many segments of our society — screamed bloody murder. To the extent this happened, I submit this is a good thing and supports my point that this is a great opportunity for our system to rise to the occasion and function well to make a good and appropriate policy as to something new and controversial like this. 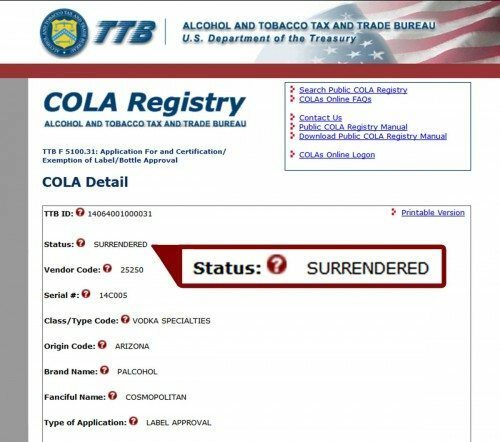 If Palcohol gets new label approvals within a few days, the “surrender” is probably a little speedbump on a long road. But if it goes past a couple of weeks without new and replacement label approvals on the public database, it is a strong sign that it may be tough for Palcohol to re-acquire label approvals. 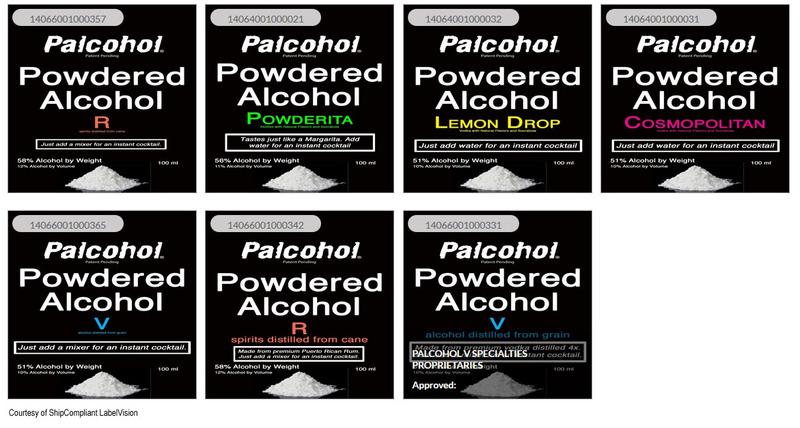 There is no lawful way for Palcohol to sell powderized alcohol in the US without these crucial approvals. John Messinger (a lawyer in our office) was doing routine research on margarita issues (things like, can the food coloring go on the back label). I am sure he expected to find various liquids, like almost always in the past. Instead he saw a big, fat reference to “powdered alcohol” on the front label — with a little pyramid of powder depicted. He found this via the amazing search capabilities of ShipCompliant’s LabelVision service, as well as other specialized search capabilities we have in the office. These tools make it easier for us to scour millions of government records. 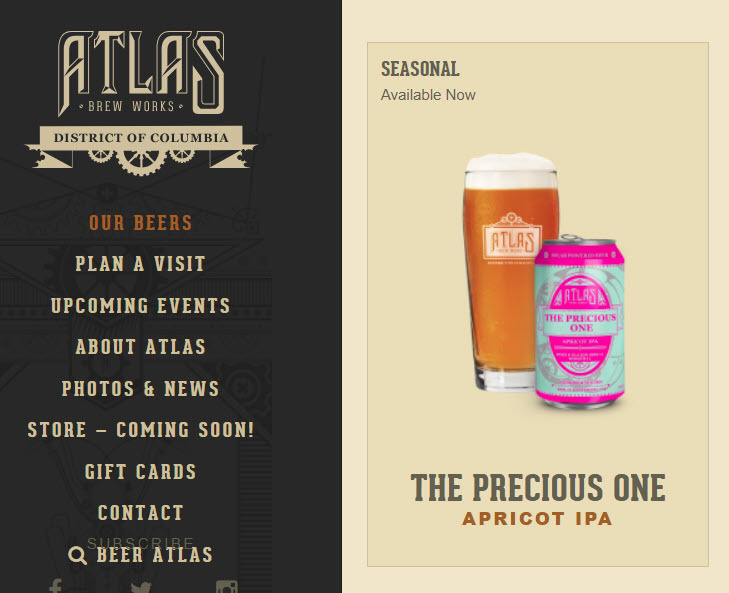 TTB approves well over 100,000 labels per year and puts them on a Public COLA Registry; we try to review most to keep an eye on new trends and rulings, like this. 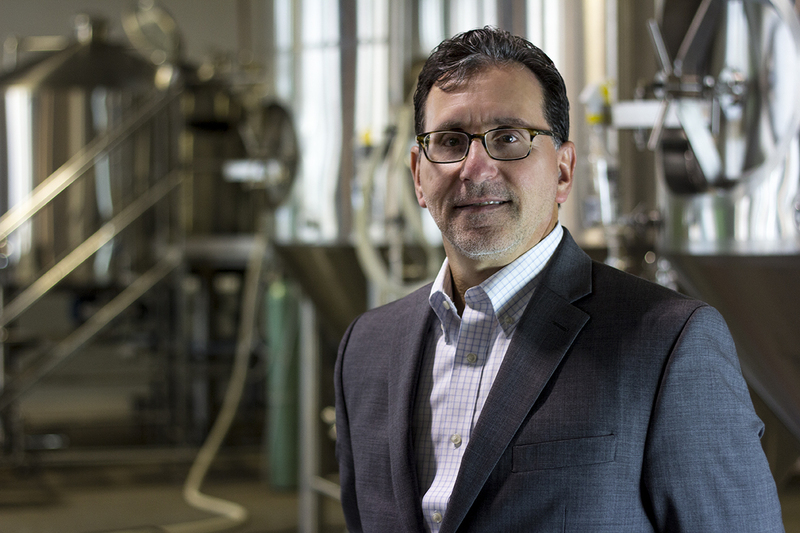 Why won’t TTB and Lipsmark say much? Lots of other information and links are set out in our earlier posts on this topic (such as the labels, a sample label approval, a surrendered approval). If you like booze and the law, it should be fun to watch this further. * And in a fine moment for lawyers everywhere, let the record reflect that the Today Show crew said they left the Chris Brown hearing early to come talk to me about Palcohol. Very interesting concept and not new. At ATF/TTB we received many, many inquiries about powdered alcohol beginning in the mid 1970’s. Most of these presentations were marketing schemes rather than actual proposals. None of them panned out due to technical problems, but it always posed a huge regulatory question of how we would respond to the real deal. Now it’s acually here. As you pointed out, there are many issues to be resolved before powdered alcohol gains acceptance. Good luck to the State and local regulatory agencies that need to look, right now, at all of the ramifications powdered alcohol presents. with the marketing of powdered alcohol products (beverages). But (then,1977/8) BATF was very helpful in assisting us with approval of SURESHOT Instant Cocktails (powdered alcohol w/flavorings). He’s right, it caused a bit of head scratching, but was solved, as I recall, by tax-stamps on primary containers, total alcohol expressed in wine-gallons on secondary containers/cases, and of course, bonded production and warehouse facilities. We complied with those requirements and took the product to test market. He’s also right that there were technical problems which made the product unprofitable at that time, and I believe those problems still exist. However, BATF was most cooperative – and innovative – and I have to applaud the manner in which our applications were handled. Thanks Charlie; do you remember the one in the photo here?